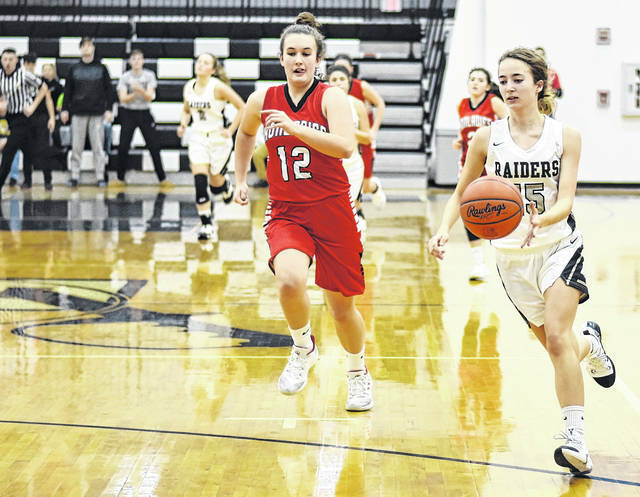 RVHS junior Savannah Reese (15) dribbles the ball on a breakaway during the second half of the Lady Raiders 36-24 victory over Jackson on Thursday night in Bidwell, Ohio. BIDWELL, Ohio — A tale of two halves. 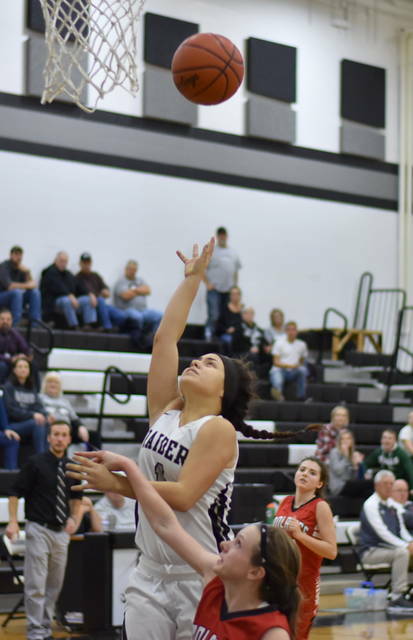 The River Valley girls basketball team trailed 15-9 at halftime, but held visiting Jackson to just two field goals in the second half en route to a 36-24 victory in non-conference contest in Gallia County. The Silver and Black (2-1) trailed 4-0 through the opening 3:15 of the contest, but manufactured a 7-1 scoring run to close out the first period with a 7-5 advantage. Jackson (0-1) rallied in the second quarter to take a six-point advantage, as RVHS made 1-of-10 shot attempts in the period. The Ironladies outscored the hosts by a 10-2 margin in the second quarter, to take a 15-9 lead into the intermission. The Lady Raiders began the second half with a 7-0 scoring run, as they took a 16-15 advantage with 5:07 remaining in the third quarter. Jackson regained the lead, at 17-16, a mere 1:07 later, however, RVHS closed out the period on a 7-0 run to take a 23-17 advantage into the finale. The Silver and Black widened the margin in the fourth quarter, as they utilized a 6-of-11 shooting performance while holding JHS to 2-of-9 from the field. RVHS outscored the visitors 13-7 in the finale, en route to a 12-point, 36-24 victory. The Lady Raiders finished with 14-of-47 (29.7 percent) shooting performance from the field, including 2-of-13 (15.3 percent) from three-point range. In contrast, the Ironladies shot 6-of-59 (10.1 percent) overall, including 3-of-19 (15.7 percent) from long distance. Jackson won the rebounding battle by a slight 33-to-32 margin. The visitors also committed 25 turnovers, while River Valley had 23 giveaways in the victory. Hannah Jacks led the Lady Raiders with 10 points, as Kaylee Gillman was next with eight points, including two three-pointers. Beth Gillman added seven markers, including one trifecta, while Kelsey Brown followed with five points. Cierra Roberts finished with four markers, as Savannah Reese rounded out the scoring for River Valley with two points. Katelyn Webb led the visitors with 14 points, including three trifectas and a 5-of-8 performance from the charity stripe. Gracie Walburn was next for the Ironladies with four markers, as Emma Stroth, Bronwyn Nelson and Lauren Elliott each finished with two points apiece, respectively.